This past week, my friend James drove up from Southern California for our long-discussed ocean fishing trip. 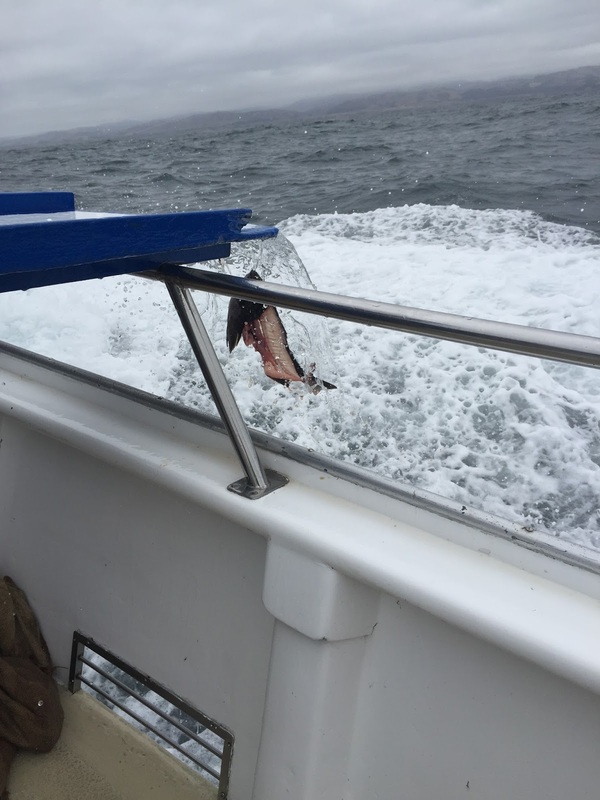 I had booked two spots on a charter fishing boat out of Half Moon Bay for Tuesday. We were excited. Two days before the trip, James had brunched with his cousin in Monterey, overlooking a glass-like ocean. The weather had been so wonderful. To quote George Costanza, "The sea was angry that day, my friends." We carried food (far too optimistically, it turned out) with us and slapped scopolamine patches on when we left the house, around 5:30am, just in case we were bothered by the slight wobble of a calm ocean. By 7am, we were on the boat, and soon afterwards, we were exiting the harbor. The captain warned us that the ocean was bad. He threatened swells taller than men. It was horrible. As soon as we made our first stop over relatively shallow water to catch our black rockfish limit, most of the 26 anglers hugged the rails, puking—sometimes gently, sometimes violently—over the edge of the boat. I tried to will my nausea away, but found after catching a fish and trying to concentrate on it well enough to remove the hook and toss it in my gunny bag, that I couldn't hold it. The attempt to focus amplified how unstable the fluid contents of my body were, and I vomited over the side of the boat. Puking provided immediate albeit temporary relief. My friend James held out from the vomit party, but he was pretty green around the gills just the same. One man, a former member of the Coast Guard, was so sick I worried about him as he hunkered down on the back of the boat, only lifting his head towards the water occasionally to throw up. But, Wallace, our deckhand, stayed cheerful and helpful as he moved from person to person, hosing puke off the boat, helping to dehook fish, smiling when the rest of us couldn't. He was the hero of the day. Pleasantly for us, within an hour or so, the scopolamine patches kicked in, and then both of us were free to enjoy the ocean. We brought in a steady haul; each of us caught 8 of our 10 allowed fish. The captain teased me about puking for fish, and I was well enough to laugh along with him. When I felt human again, being on a boat in the ocean was beautiful. To get from fishing spot to fishing spot searching for other species of rockfish, we flew over and between waves, the boat cutting into the cold green. I hung out along the side of the boat, facing forward, and the spray coated the front of me, drying to a wild mineral tang on my face. We saw whales blow, one even lifting its huge dark body out of the water. Sunfish dotted the surface of the choppy ocean, and gulls followed us wherever we went. As we headed back to the harbor in the afternoon, Wallace lifted a guttered board from the side and strapped it down across the width of the boat. He set a hose of ocean water on one end and fit a slotted fence in place across it. Taking a wide, elastic-kneed stance to roll with the waves, he dumped a gunny sack of fish behind the fence, then cleaned and fileted our catches. The hose water carried guts and skeletons over the side of the boat, on which our trailing flock of gulls swept down to feast. Watching him work, I realized that a couple hundred years ago, I could have watched nearly the same scene. The cycle of fishing and cleaning and gulls could have come from a Melville novel, but Wallace smoked a cigarette, not a pipe, and I, thank God and science, had a scopolamine patch. Last night, I brought rockfish ceviche to a party. I felt like a rockstar when I told other guests I had not only made the dish, but had caught the fish. I didn't, mind you, tell them what I used as bait. When I make ceviche, I use Hank Shaw's basic recipe with some riffs, and I urge you to read his post as he explains the risks of raw fresh fish. In our case, I vacuum sealed one pound portions and threw them in our very cold chest freezer right after we got home from our fishing trip. I feel comfortable using the fish in a raw application, such as ceviche. I recommend the grapefruit juice and addition of zest that Shaw uses in his recipe, and the fresh corn his recipe calls for is essential. However, instead of a diced Roma tomato, I prefer halved cherry or grape tomatoes for the sweet punch of summer flavor. Also, on occasion, I've added some mint and a healthy dollop of coconut cream to make the whole mixture lush and tropical.